Can you ever forget those carefree days, when love and affection of parents was taken for granted, your wish was their command and the world was joyously filled with chocolates and ice creams? Or can you ever forget those short, entertaining stories told by your mother, aunt or grandmother, in her sweet honeyed voice, holding your head in her lap, gently rocking you back and forth, bringing a fancy world alive in front of your wide open eyes? Well, I think, these are the sweetest and most cherished moments of my childhood and probably, yours too! But, how often have you thought about the childhood of your cherished storytellers? Were they also kids like us? Were they also naughty, rebuked for their pranks and then cajoled by their loving parents? Well, if nature does follow linear rules of time, it is very much possible that our aunts and mothers can also boast of an innocent childhood, hectic youth and inevitable stagnancy of old age. ‘My Sainted Aunts’ by Bulbul Sharma is one such rare attempt to bring alive the past of our favorite storytellers, touching upon the well kept secrets of their lives, gently enjoying their heady romance, bringing alive their cherished childhood moments. Be it Mayadevi of “Mayadevi’s London Yatra”, Mini of “Child Bride” or Neelima of “Bishtupur Landing”, each character of this collection is unique and each story touches upon the hitherto unknown facets of women and their tryst with life. The first story of the collection is simply titled as “Mayadevi’s London Yatra”. And, as is evident from the very title, the story revolves around an old widow, trying to prove her mettle in ripe old age. Her son, Amit is a famous dentist in Queen’s own country and has ample amounts of money, but is afraid of flying and is thus not able to come back to India, even to meet his old mother. Thus, Mayadevi decides to go to London herself and show her son, that she is capable of undertaking difficult challenges despite her age old beliefs in Hindu traditions. However, something strange happens to her in London, and she ends up forgetting all her old rules and superstitions. With this good crisp story with a unique approach towards changing times, Bulbul set the tone of “The Sainted Aunts” as serious and somber. However, the very next story “Bishtupur Landing” that talks about the journey of Neelima from a reluctant, plump student to a dreamy eyed bride had me in splits. Neelima desperately wants to get married to escape school and her strict father, however, she ends up being judged as a fat newlywed by her husband’s relatives and the story exposes the challenges a new bride has to face in her new house, in a light humorous tone. The next story of the collection, named as “Child Bride” revolves around the volatile issue of child marriage and concentrates on seven year old Mini who has no choice, but to get married and proceed to her in-laws, in a strange house and stranger family. Bulbul in her inimitable comic style brings forth the prejudices hurled upon Mini by the insensitive female relatives, and very innovatively stresses upon the worthy support, she discovers in her husband, with their innocent friendship flowering into a lifelong romance. Another story that managed to strike a chord revolves around the travesties of a tall woman, Roopbala, who is hated by her vertically challenged, ill tempered husband. The short man hates his wife so much that he is ready to murder her. However, gutsy Roopbala thwarts his attempt and ends up in the serene hills of Badrinath, to discover the final justice of God. On similar lines, is the story of Geeta, who enters service in a palace, that everyday sinks a little into the pond beneath its foundation. However, Geeta rediscovers her true worth in the dilapidated walls of the crumbling palace and regains her husband’s love in this twisting emotional tale. 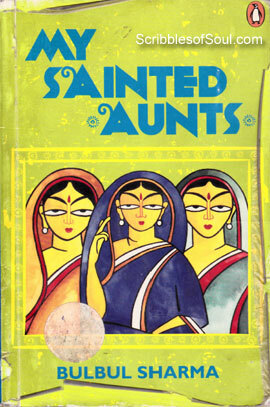 ‘My Sainted Aunts’ is simply a collection of eight stories. However, it is different from any other collection, I have read so far. Though, the approach and subject matter is different in each story, yet, they have a continuity and form an integral part of the journey called life, rapidly changing gears from joy to sorrow, with laughter giving way to serious thoughts. Enjoying the rise and fall of this emotional roller coaster, I was not bored for even a second, and eagerly awaited the next twist in Bulbul’s innovative tales. I must say, I was more than impressed by Bulbul’s unique, entertaining short stories, revolving around old ladies, bringing alive their past, as a coy bride, as a young wife and as a strong old mother. I, particularly liked the above mentioned five stories, and I feel, this collection is a must read for anyone with a healthy appetite for short, crisp stories. A laudable attempt!